While on a quiet winter morning hike through the forest, our Nature Baby club noticed something scurrying quickly by their feet! Some reddish-brown fur, with dark and light stripes, could be seen. The group leaders had to quickly double take! Seeing a Chipmunk running through the forest this time of year is pretty unusual since they should be hibernating! Near the end of July, they begin collecting and storing large amounts of seeds. 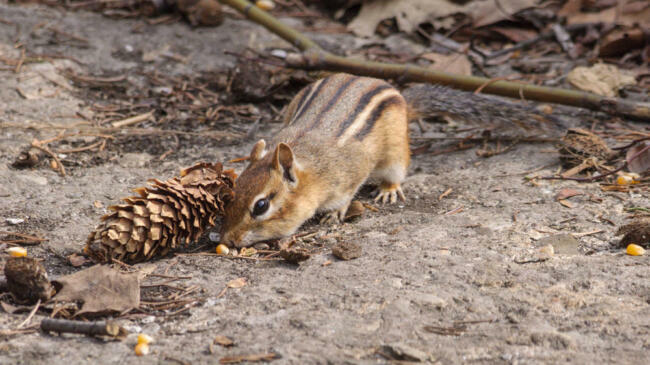 By October, a chipmunk would have accumulated enough seeds for them to survive the winter. They will finally disappear below the ground for their hibernation sometime in November. During their hibernation, chipmunks will go through periods of torpor; a state of extreme physiological inactivity. Between these periods of torpor, they will wake up and consume part of the food supply that they worked so hard to collect and store. The first warm days of March are when we typically expect to see chipmunks coming out of their hibernation. Since this neat nature happening, we’ve had a lot of fun trying to figure out the reasons behind this unusual behaviour!